A general view of the U.S. embassy in Moscow, Russia, Dec. 30, 2016. Russia's Foreign Minister asked Vladimir Putin to expel dozens of U.S. diplomats in retaliation for sanctions and expulsions of Russian diplomats announced by the U.S.
Foreign Minister Sergey Lavrov said in televised remarks on Friday that the foreign ministry and other agencies have suggested Putin order the expulsion of 31 employees of the U.S. embassy in Moscow and 4 diplomats from the U.S. consulate in St. Petersburg. Another suggestion is to bar U.S. diplomats from using their summer retreat on the outskirts of Moscow and a warehouse in the south of Moscow. Obama called his actions "a necessary and appropriate response to efforts to harm U.S. interests in violation of established international norms of behavior." U.S. President-elect Donald Trump, who had scoffed at allegations of Russian interference in the U.S. election, said Thursday he would meet with intelligence leaders next week for a briefing on the situation. The president's action coincided with the release Thursday of a 13-page joint analysis by the FBI and the Department of Homeland Security that squarely blamed Russia's intelligence agencies for hacks intended to influence the 2016 election and provided technical details, including samples of malicious computer code said to have been used in their cyber hacking campaign. Among the actions ordered by Obama Thursday are sanctions against nine Russian individuals and entities: the GRU, Russia's military intelligence agency, the FSB, its foreign intelligence service, four GRU officers, and three companies that provided material support to the GRU. In addition, Evgeniy Bogachev and Aleksey Belan were also sanctioned. The Treasury Department calls them "notorious criminals" who are responsible for the cybertheft of more than $100 million dollars from U.S. banks, companies and other American firms. 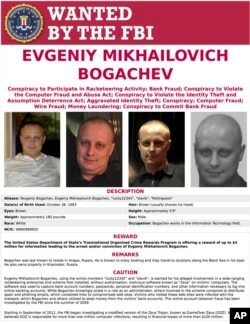 This image provided by the FBI shows the wanted poster for Evgeniy Bogachev. Thirty-five Russian government officials in Washington and in the consulate in San Francisco were given 72 hours to leave the United States for "acting in a manner inconsistent with their diplomatic status and consular activities." Russian officials also will be denied access to what the U.S. State Department calls two Russian government-owned recreational compounds in Maryland and New York. This is after U.S. diplomats in Moscow were harassed and physically assaulted. "In addition to holding Russia accountable for what it has done, the United States and friends and allies around the world must work together to oppose Russia's efforts to undermine established international norms of behavior and interfere with democratic governance," Obama said in announcing the sanctions. A senior White House official said Thursday's publicly announced actions are not the end of the American response. He said there will be other measures that will not be publicized. The official said there has been no debate within the Obama administration over whether Russia indeed interfered in the presidential election, primarily by hacking Democratic party emails to harm Hillary Clinton's campaign and boost Donald Trump's chances of winning the November 8 election. The official said the White House believes Russia is gong to try to interfere in elections in other countries. 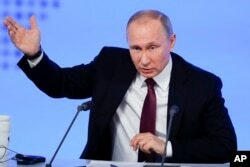 Russian President Vladimir Putin gestures as he speaks during his annual news conference in Moscow, Russia, Dec. 23, 2016. He also said he has no reason to believe Russia will not try the same thing again in future U.S. contests. The next major American election will be in 2018, for the entire House of Representatives and a number of Senate seats. The Obama administration had warned the Kremlin numerous times in public and private that it knows what Russian hackers are up to and that Thursday's sanctions should not come as a surprise to anyone. It has also said it is inconceivable that Russian President Vladimir Putin knew nothing about it. A Kremlin spokesman said Moscow is posing an "appropriate" retaliation and accused the United Sates of trying to destroy ties with Moscow. President-elect Trump, who has made no secret of his desires for better ties with Moscow, responded to the sanctions by saying it is time for the country to "move on to bigger and better things." And he intimated that he still has doubts about Russia's involvement in the election. "In the interest of our country and its great people, I will meet with leaders of the intelligence community next week in order to be updated on the facts of this situation," Trump said in a statement. Emma Ashford, a foreign policy expert from the Cato Institute, told VOA Trump would face a lot of opposition from Congress if he tries to undo the sanctions. "Part of why this has been so difficult for the Obama administration is they were also trying to find something that Trump could not on his first day in office undo," Ashford said. She added that the Obama administration must "try to send a signal that no matter what Donald Trump might say about how much he likes Vladimir Putin and how we're going to improve relations with Russia, that there has to be some sort of penalty for what the Russian tried to do in the election." A State Department official said Thursday reversing Obama's orders would be "inadvisable," adding that it makes no sense to invite Russian intelligence officials back into the United States. Thirty-five is the second largest number of Russian diplomats ordered out of the United States at one time since the end of the Cold War. President George W. Bush expelled 50 Russians in March 2001 for alleged spying. President Ronald Reagan deported a total of 80 Russian diplomats also suspected of spying during the fading years of the Cold War in 1986. Elizabeth Chernoff and the Associated Press contributed to this report.